Woman captured on surveillance video painting anti-Semitic graffiti on Oklahoma Democratic Party headquarters in Oklahoma City. Police have arrested a suspect in a spree of anti-Semitic and racist graffiti in Oklahoma City and the neighboring city of Norman, JTA reported on Thursday. A woman was caught on surveillance video painting white supremacist, racist and anti-Semitic graffiti on the Oklahoma Democratic Party headquarters in Oklahoma City. She is the main suspect in new vandalism in Norman, according to the report. Three locations in Norman, located about 20 miles from Oklahoma City, were vandalized with swastikas, ethnic slurs, and other racist graffiti on Tuesday night. The Firehouse Art Center, McKinley Elementary, and the Cleveland County Democratic Party Headquarters were all defaced, the Norman Transcript reported. Last week graffiti was scrawled in Oklahoma City on a building that is also home to state agencies, non-profit groups and businesses. The phrases included “Welcome to Germany,” “Trump hates Israel,” “Gas the Jews,” and “The Goyim know,” as well as the number sequence 1488, which is a reference to Adolf Hitler. Earlier this week, swastikas were found spray-painted on a sidewalk in the Brooklyn neighborhood of Greenpoint. Police launched an investigation. 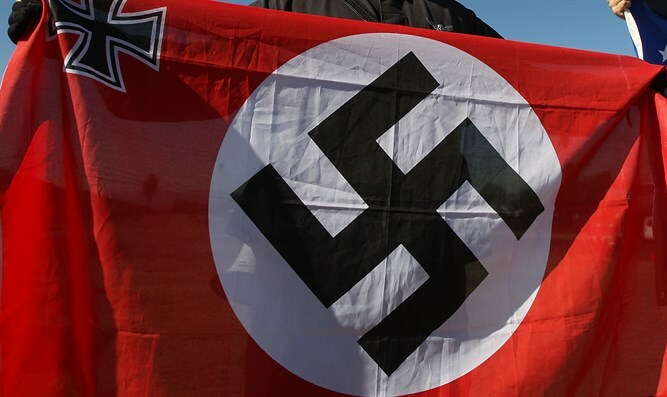 Last week, police in the city of Flagstaff, Arizona, launched an investigation after hate symbols were found at a local synagogue. In mid-March, swastikas and anti-Semitic epithets were drawn on at least 30 gravestones at a Jewish cemetery in Fall River, Massachusetts.